It's getting hotter. The Women's World Cup excited us. It was one of the very few good news. Winning the Women's World Cup by the Japan women's national football team called Nadeshiko Japan (なでしこジャパン) gathered more than 17,000 people at a game of the women's soccer league "the Nadeshiko League" although a game of the league before the world cup gathered only 448 people. 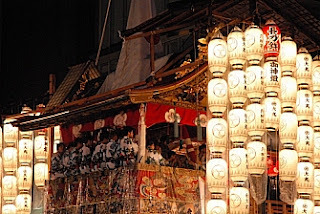 The Gion Festival(祇園祭) is being held at Yasaka Shrine (八坂神社) in Kyoto from July 1st to the 31st. The Kyoto summer is extremely muggy, but people in Kyoto certainly look forward to the festival and realize that summer has come by it. 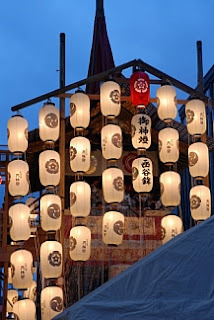 Although the festival's highlight Yamaboko-junko or Yamahoko-junko(山鉾巡行) was over, I hope this information helps future visitors to the festival. Various events are being held until 31st. I heard that little people living in Kyoto saw all events of the festival. 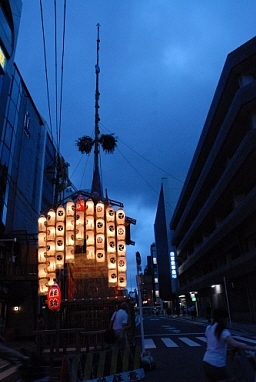 The festival was originally started to counteract the epidemic spreading across Japan in 869. 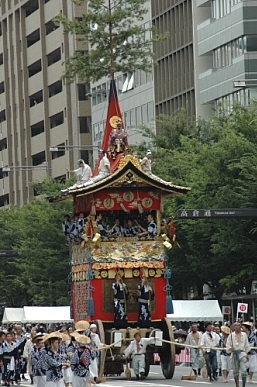 The Imperial Court aimed to throw evil spirits with hoko(鉾) into the fountain of Shinsen-en temple(神泉苑) after leading evil spirits to possess stainding 66 hoko. Hoko is an older form of Japanese spear like a double-edged sword with a long handle. It is said the festival has been held every year since 970. Each town came to elaborate decorated floats by the hands of residents including wealthy merchants and craftsmen. The festival was suspended by the Onin War (応仁の乱, 1467–1477), but it was revived in 1500. 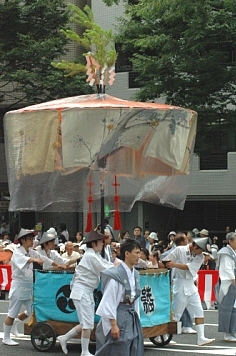 The power of the day didn't like yamahoko(yamaboko) floats that got more extravagant year by year and banned parading the floats in 1533. 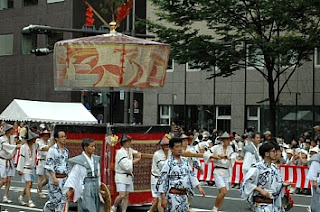 Town people went ahead with parading the floats not as a shrine ritual but as a festival for town people. 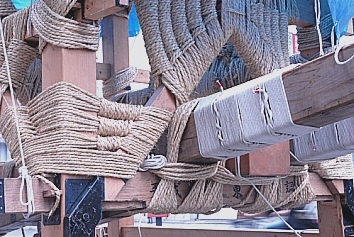 At that time their floats cut a sacred rope that was stretched across a road to block their progression. 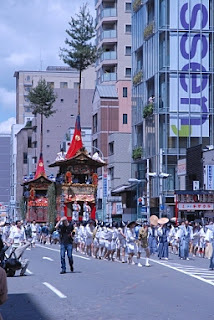 So the Gion Festival is not only a shrine ritual but also a festival for town people. Yamahoko floats consist of 23 Yama floats and 9 Hoko(Boko) floats. The floats were created based on scenes from historical events, legends and folktales in Japan and China. .Hoko stands on the roof of hoko floats, but three of them don't have hoko. 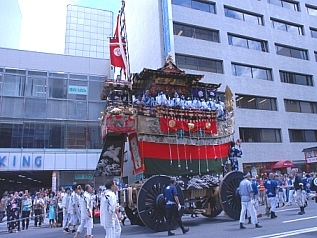 Fune-boko(船鉾) has the shape of a ship. Ayagasa-boko(綾傘鉾) and Shijokasa-boko(四条傘鉾) have a parasol. People pull hoko floats. 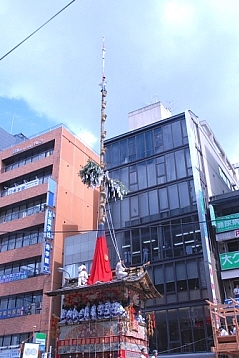 ﻿﻿﻿Three of 23 yama floats resemble a hoko float in appearance, but a pine tree in place of hoko stands on their roofs. 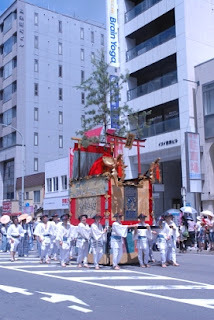 Other yama floats have pine or cedar tree. People used to carry them on their shoulders, but they have wheels now. The sections of the Yamahoko floats are all put together only with straw ropes, without using nails, during five days starting from 10th. ﻿﻿ They are drawn as a trial during three days startingfrom 12th. Ordinary citizens including women can take part in this trial. ﻿ You can take a good look at the floats from the outside during and after construction. Some of them are open to the public, but Naginata-boko(長刀鉾) and Hoka-boko(放下鉾) are barred to women. Chimaki(粽) and goods such as lucky charms, folding fans and tenugui(a piece of dyed cotton cloth) unique to each float are sold at local meeting places around the floats. 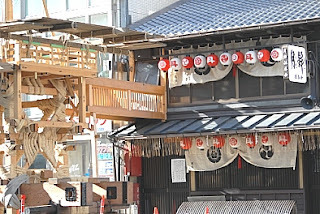 People hang chimaki near their front doors as a charm against bad luck. Usually chimaki means a cake made with rice flour wrapped in bamboo leaves, but this chimaki's body is hollow. From 14th to 16th, the floats are lit up with paper lanterns in the evening. You can hear festive music here and there. 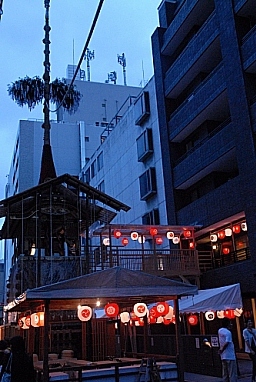 Stands of food and drink are on sale. The streets in Kyoto are heavily packed with visitors at this time. On the sidelines of the festival, 16 private homes and companies show their art works including folding screens to the public from 14th to 16th. 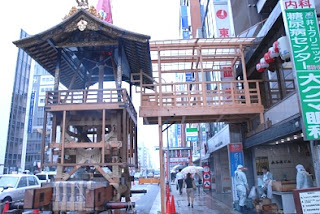 It's called Byobu-Matsuri(屏風祭) which literally means "folding screen festival".